China (Zhongshan) International Games & Amusement Fair 2018 is one of the most professional entertainment equipment fairs, aiming to provide a more wide-ranging platform for manufacturers from all around China. Been joined China (Zhongshan) International Games & Amusement Fair 2018 for 10 years and got a lot of good feedback from Insiders, We, Neofuns is one of the most important Exhibitors on this fair. Many of our Claw Machine and Cut Ur Prize Toy Game Machine are popular among our clients and Competitors. They are surprised by the outlook, quality, and functions of our machine. Without a doubt, many new members are very interested in this kind of game machine and coming to ask for equipment operation and technical support. 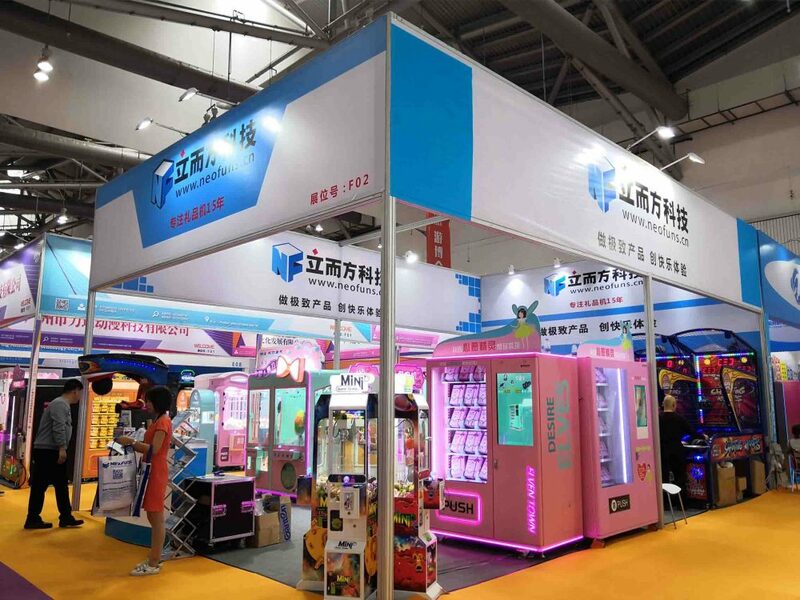 2018 is the 10th anniversary of Zhongshan International Game Entertainment Expo, the sponsor made the extremely strict requirements which is asking the exhibitors to bring the newly designed machines to join the fair. The requirement for us, Neofuns is very easy as we always keep researching and developing a new game machine to suit for the market. Also, our newest machine -The Lucky Gift Machine and Lipstick Game Machine have already won a lot of good commands and impression from the fair sponsors which makes us became the best exhibitors of the Good Service and Technical Support.